States everywhere are feeling the squeeze in their transportation budgets. As gas taxes stagnate, they either have to raise revenue or cut spending. Before we rush to the polls this fall, let’s take stock on how our current system is performing. 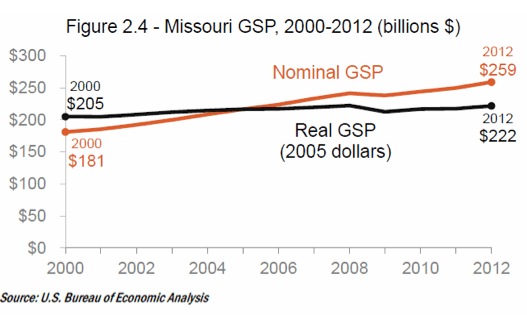 Missouri Gross State Product (GSP) is up 8.3% 2000-12, while it is up 23% in the entire country. Clearly the new and expanded roads built in the ’90s and ’00s aren’t helping us out-perform the rest of the country. Vehicle miles traveled on Missouri state highways is flat 2000-2012. So there’s little demand for more. Next compare Missouri GSP per Vehicle mile traveled. This is up 7.1% 2000-12. We are getting more out of the traveling we do. The economy is changing. State DOTs are living in the past. If one went to prospective investors and presented these projections for market growth vs. reality you’d be laughed out of the office. So will doubling down on state highways make us wealthier? Is giving $8B over the next ten years to the state for this one purpose worth the opportunity cost? It’s up to voters to decide. Elsewhere on the Network today: The Greater Marin says transit officials should be required to use their own service. Systemic Failure balks at the super-low minimum car insurance coverage required in California. And The Active Pursuit reports that some schools in Wisconsin are trying a winter walk-to-school day.